Luisito Fabrigas started growing coffee in the late 70’s, and hasn’t stopped since. He talks to the coffee plants in his farm and drinks Robusta coffee three times a day. He has grown more than 4,000 coffee seedlings and he wants to plant more in his lifetime. 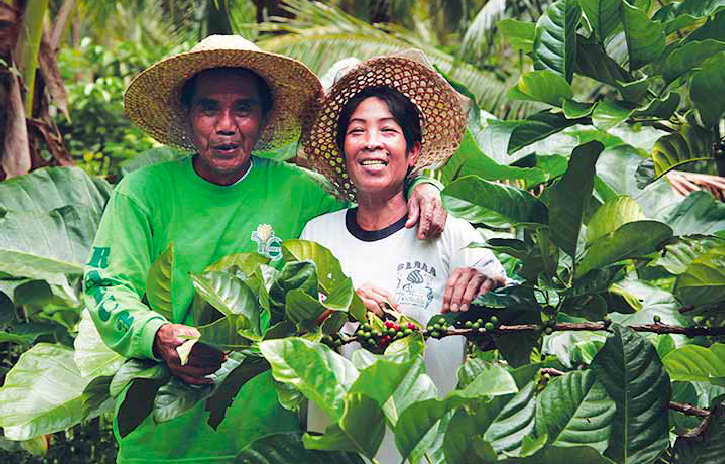 This farmer-scientist cannot imagine life without coffee—and he is Luisito Fabrigas from Dipaculao, Aurora. 1,100 kilograms (kg) of coffee beans. they saw the perks of doing so: big demand, good price. To help propagate coffee growing in his province, the Department of Agriculture gave Fabrigas 30,000 seedlings, which he distributed to interested coffee growers in his municipality. 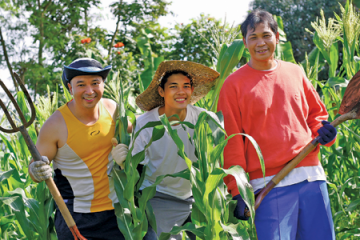 Gradually, other municipalities like Borlongan and Maria Aurora began to take up growing the crop as well. Fabrigas says that he applies what he has learned in the course of his journeys to learn more about growing coffee, and willingly shares his secrets to success: the right hole size for planting, good seedlings, and proper care and maintenance. He is also an organic coffee farmer. 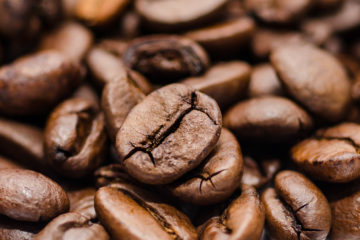 Coffee is harvested weekly from the 35-year-old coffee plants on his farm, which yield two cans each of coffee beans. Fabrigas shares that he takes extra care of the branches and flowers to prevent them from being damaged, especially during harvest. 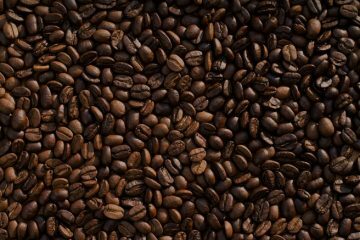 He adds that in his experience, coffee is a product that can be stored for years without rotting or becoming infested with pests so long as it is dried properly. Because of his good coffee, he has many clients. His market includes Bahia de Baler and other hotels in San Luis and Maria Aurora. Fresh green coffee beans are sold for Php160 per kg, while the dried beans are sold at Php320/kg. Although Fabrigas started with traditional methods of coffee processing, he has now a complete set of coffee processing equipment, including a pulper, huller, dryer, roaster, grinder, and packaging machine. He says that the equipment makes the process much faster than the old manual method of processing, and the mechanization of his processing enables him to accept more orders. In terms of cost, he says that traditional practices are cheaper but there are too many processes involved. With the use of coffee technology, although there are costs incurred for gasoline and electricity, he can still make a good profit. 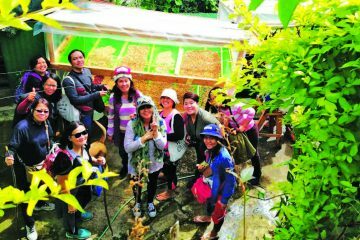 Fabrigas estimates that for every kilo of dried coffee, once hullered and roasted, he makes back Php1,200, and cheerfully adds that this is why he loves the crop. After all, sales really picked up in 2009, after he began processing coffee. He and his wife were able to send their children to school thanks to the crop. agencies like the Department of Science and Technology (DOST). having been named a farmer-scientist for coffee by the Philippine Council for Agriculture, Forestry and Natural Resources Research and Development (PCARRD) of the DOST. and technologies like the pulper, moisture meter, huller, and all-weather dryer. The result is a more efficient coffee processing operation, and he is able to meet the growing market demand for his product. 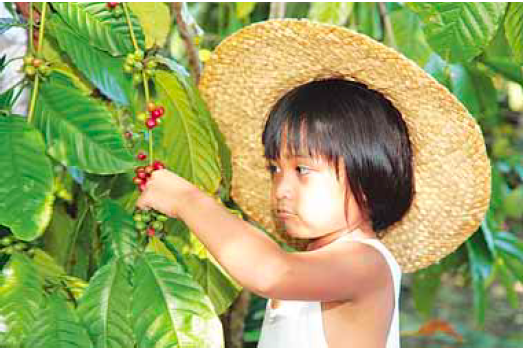 Eiron, Fabrigas’ grandson, learns to pick coffee berries at a young age. More coffee plants. More coffee berries to harvest and process. These are what Fabrigas hopes to see in the coffee industry. This way, more coffee farmers and entrepreneurs will benefit. The country will also become less dependent on coffee imports. He also hopes to establish his own coffee shop just in front of his house in Barangay Diarabasin, Dipaculao, Aurora. 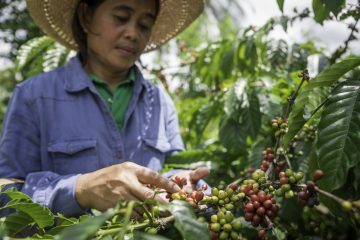 “I love coffee,” the farmer-scientist often says to friends, relatives, and acquaintances. And this isn’t mere lip service. This coffee lover shows his great love for coffee in his work, in his life, and in his dreams. This appeared as “The Coffee Lover” in Agriculture Monthly’s January 2015 issue.